The development of EDZs (economic development zones) is going full steam ahead in the country after the publication of decrees on the establishment of economic development zones in provinces by the Presidium of the Supreme People’s Assembly on November 21 2013 and July 23 2014. EDZ is a special economic zone in which preferential treatment is given to economic activities pursuant to the DPRK law on economic development zones. After the publication of the decrees, provincial people’s committees began to work out master plans for economic development zones and create environment for investment. As a result, master plans for such development zones have been approved by provincial people’s assemblies including the Amnokgang economic development zone in North Phyongan Province, Manpho economic and Wiwon industrial development zones in Jagang Province, Sinphyong tourism development and Songnim export processing zones in North Hwanghae Province, Hyondong industrial development zone in Kangwon Province, Hungnam industrial and Pukchong agricultural development zones in South Hamgyong Province, Chongjin economic, Orang agricultural and Onsong island tourism development zones in North Hamgyong Province, Hyesan economic development zone in Ryanggang Province, Waudo export processing zone in Nampho City, and Chongnam industrial and Sukchon agricultural development zones in South Phyongan Province. Master plans for other development zones are being worked out at the final stage. With master development plans approved, provincial people’s committees are now working to attract more foreign investors and developing businesses to cooperate with their projects. In October last year the Russian minister of Development of Far East visited the Chongjin EDZ together with Russian businesspersons to check the state of development and discuss matters of investment and development with officials concerned of the North Hamgyong Provincial People’s Committee. Cooperation is being stepped up with Chinese businesses in the Onsong island tourism development zone in the wake of the opening ceremony of tourism in the Chongsu tourism development zone in Sakju County, North Phyongan Province in October last year. Governments of some Southeast Asian nations are showing particular interest in the investment in the Sukchon agricultural development zone in South Phyongan Province. Preparations are expected to be made for receiving investment in the development zones and the EDZs offer preferential treatment to developing businesses and investors with independence in management. Management agencies are being set up in EDZs, experts needed for the development of these areas trained in universities in Pyongyang and provinces and technical personnel dispatched to other countries for practice. Brisk activities for the development of EDZs in provinces across the country are attracting growing interest of experts and investors in many countries of the world, especially Asia-Pacific and Southeast Asian nations. North Korea has enacted the Economic Zone Development Act on May 29 this year and explained, “The economic development zones are special economic zones where preferential treatments are guaranteed in accordance with appropriate laws as provided by the state.” It also elucidated that the provincial level SEZs were to be managed differently from the central-level SEZs. On October 16, the institution in charge of the central-level economic development zones, the General State Economic Development Department, was upgraded to become the State Economic Development Commission, with Kim Ki Sok appointed as the commission’s chairman. Kim served as the vice-chairman of the Joint Investment Committee of Korea. In addition, the Korean Economic Development Association was established as a private organization, with Yun Yong Sok being named as president. Provincial-level economic development zones will be open to joint venture company or independent investment by a foreign company and 50 years are guaranteed as the cooperation period. Each of the 13 SEZs in each province will be developed incorporating the special characteristics of each region. The total amount of investment permitted in this area will range from 70 million USD to 240 million USD. The provincial-level SEZs will be managed by the Economic Zone Development Bureau. With the announcement of the names of the 13 SEZs, it is likely the development plans is likely to proceed rather rapidly. On the other hand, Sinuiju SEZ is reported to be developed as a central-level zone. In 2002, Sinuiju already had received the title as a special administrative region but after the arrest of the Administrative Minister Yang Bin, the development of this area came to a halt. The plan for Sinuiju SEZ is likely to be developed as state-of-the-art, comprehensive special zone modeled after China’s Shenzhen SEZ. A Joint Venture Investment Committee and an international group from Hong Kong will hold 50:50 shares and establish a new joint venture company. Sinuiju is especially located in a geographically advantageous area, adjacent from Dandong City divided by the Amnok (Yalu) River and it is well connected through railway and bridge that connects the two cities. The currently under construction New Yalu River Bridge is also in progress and expected for completion early next year. ORIGINAL POST (2013-11-21): Until this year, there were four Special Economic Zones (SEZs) in the DPRK: Hwanggumphyong and Wihwado Economic Zones, Kaesong Industrial Zone, Mt. Kumgang Tourist Special Zone, Rason Economic and Trade Zone. There is also a new “Kaesong Latest Science, Technology Development Zone” under construction. On November 21, 2013, KCNA reported additional information on the continuing evolution of the DPRK’s Special Economic Zones (특수경제지대) and Economic Development Zones (경제개발구). Pyongyang, November 21 (KCNA) — The DPRK decided to set up a special economic zone in some part of Sinuiju, North Phyongan Province. The sovereignty of the DPRK will be exercised in the zone. A relevant decree of the Presidium of the Supreme People’s Assembly of the DPRK was released on Thursday. (평양 11월 21일발 조선중앙통신)조선에서 평안북도 신의주시의 일부 지역에 특수경제지대를 내오기로 하였다. Sinuiju has been proposed as a Special Administrative Region (SAR) before. You can read all Sinuiju SAR posts here. Here is the announcement in KCNA from 2002-9-20 announcing the SAR. Ultimately the endeavor was not successful, thought it ultimately led to the creation of the nearby Hwanggumphyong and Wihwado Economic Zones. On the same day that KCNA made this announcement, they also offered more information on the new provincial level “Economic Development Zones (경제개발구). I am unsure of the relationship between “Special Economic Zone” and “Economic Development Zone”. The DPRK is to set up economic development zones in provinces. A decree of the Presidium of the Supreme People’s Assembly of the DPRK was released Thursday. According to the decree, some part of Ojok-ri, Uiju County, North Phyongan Province will come under the jurisdiction of Ryongun-ri. 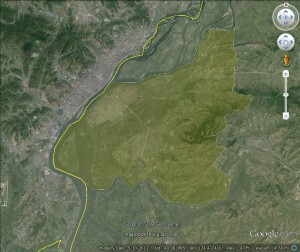 Ryongun-ri will belong to Sinuiju and be called North Phyongan Provincial Amnokgang economic development zone [압록강경제개발구]. Jagang Provincial Manpho economic development zone [자강도 만포경제개발구] will be established in some areas of Mitha-ri (including Poldung Islet) and Phosang-ri, Manpho City, Jagang Province and Jagang Provincial Wiwon industrial development zone [자강도 위원공업개발구] will be set up in areas covering part of Tokam-ri and part of Kosong-ri, Wiwon County. North Hwanghae Provincial Sinphyong tourist development zone [황해북도 신평관광개발구] will appear in some areas of Phyonghwa-ri, Sinphyong County, North Hwanghae Province and North Hwanghae Provincial Songrim export processing zone [황해북도 송림수출가공구] will be set up in some areas of Sosong-ri, Songrim City. Kangwon Provincial Hyondong industrial development zone [강원도 현동공업개발구] will be set up in some areas of Hyondong-ri, Wonsan City, Kangwon Province. South Hamgyong Provincial Hungnam industrial development zone [함경남도 흥남공업개발구] will take its shape in some areas in Haean District, Hamhung City, South Hamgyong Province and South Hamgyong Provincial Pukchong agricultural development zone [함경남도 북청농업개발구] will be created in areas covering part of Mundong-ri, Pudong-ri and Jongsan-ri of Pukchong County. North Hamgyong Provincial Chongjin economic development zone [함경북도 청진경제개발구] will be set up in areas covering part of Wolpho-ri, Susong-dong and Namsok-ri, Songphyong District, Chongjin City, North Hamgyong Province. North Hamgyong Provincial Orang agricultural development zone [함경북도 어랑농업개발구] will appear in some areas of Ryongjon-ri, Orang County. North Hamgyong Provincial Onsong island tourist development zone [함경북도 온성섬관광개발구] will be formed in some areas of Onsong township, Onsong County. Ryanggang Provincial Hyesan economic development zone [량강도 혜산경제개발구] will appear in some areas of Sinjang-ri, Hyesan City, Ryanggang Province. Some areas of Ryongnam-ri, Waudo District, Nampho City will turn into Nampho City Waudo export processing zone [남포시 와우도수출가공구]. The sovereignty of the DPRK will be exercised in the provincial economic development zones. The Korean version of this article can be found here. The DPRK announced there would be 14 SEZ/Economic Development Zones. With the inclusion of the Sinuiju Special Economic Zone with the KCNA list of 13 economic development zones, you will get 14. However, there are other economic development zones that have been announced that are not included on this list. By my count there are at least 18. If one is to be in each province, then zones in South Phyongan and South Hwanghae have yet to be announced. As mentioned before, these economic development zones are supposed to be governed by the Law on Economic Development Zones and the Economic Development Commission/Association. You are currently browsing the archives for the North Phyongan Provincial Amnokgang economic development zone category.